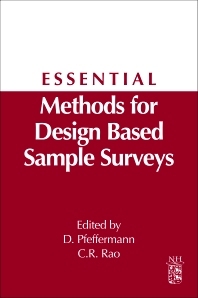 Essential Methods for Design Based Sample Surveys presents key method contributions selected from the volume in the Handbook of Statistics: Sample Surveys: Design, Methods and Applications, Vol. 29a (2009). This essential reference provides specific aspects of sample survey design, with references to important contributions and available software. The content is aimed at researchers and practitioners who use statistical methods in design based sample surveys and market research. This book presents the core essential methods of sample selection and data processing. The data processing discussion covers editing and imputation, and methods of disclosure control. This reference contains a large variety of applications in specialized areas such as household and business surveys, marketing research, opinion polls and censuses. Scientists and graduate students at universities, research institutes, and government agencies who use statistical methods in design based sample surveys and research. Professor C. R. Rao, born in India, is one of this century's foremost statisticians, and received his education in statistics at the Indian Statistical Institute (ISI), Calcutta. He is Emeritus Holder of the Eberly Family Chair in Statistics at Penn State and Director of the Center for Multivariate Analysis. He has long been recognized as one of the world's top statisticians, and has been awarded 34 honorary doctorates from universities in 19 countries spanning 6 continents. His research has influenced not only statistics, but also the physical, social and natural sciences and engineering. In 2011 he was recipient of the Royal Statistical Society's Guy Medal in Gold which is awarded triennially to those "who are judged to have merited a signal mark of distinction by reason of their innovative contributions to the theory or application of statistics". It can be awarded both to fellows (members) of the Society and to non-fellows. Since its inception 120 years ago the Gold Medal has been awarded to 34 distinguished statisticians. The first medal was awarded to Charles Booth in 1892. Only two statisticians, H. Cramer (Norwegian) and J. Neyman (Polish), outside Great Britain were awarded the Gold medal and C. R. Rao is the first non-European and non-American to receive the award. Other awards he has received are the Gold Medal of Calcutta University, Wilks Medal of the American Statistical Association, Wilks Army Medal, Guy Medal in Silver of the Royal Statistical Society (UK), Megnadh Saha Medal and Srinivasa Ramanujan Medal of the Indian National Science Academy, J.C.Bose Gold Medal of Bose Institute and Mahalanobis Centenary Gold Medal of the Indian Science Congress, the Bhatnagar award of the Council of Scientific and Industrial Research, India and the Government of India honored him with the second highest civilian award, Padma Vibhushan, for “outstanding contributions to Science and Engineering / Statistics”, and also instituted a cash award in honor of C R Rao, “to be given once in two years to a young statistician for work done during the preceding 3 years in any field of statistics”. For his outstanding achievements Rao has been honored with the establishment of an institute named after him, C.R.Rao Advanced Institute for Mathematics, Statistics and Computer Science, in the campus of the University of Hyderabad, India.